It is no secret that Switch gamers need to be a little bit more patient with releases on Nintendo’s latest console. Forgotton Anne, a platformer by Danish indie developer ThroughLine Games, is no exception here. The title first released on May 15, 2018 on Steam, PS4 and Xbox One, as fans of the hit Nintendo hybrid platform, had to wait a few months longer to finally lay their hands on that title. I’d like to assume that everyone has lost something before in their life. Might it be a scarf forgotten on the bus or the famously lost sock in the laundry. Things like we humans like to forget become so-called “forgotlings” in Forgotton Anne. Everything lands in the realm ruled by a man named “Master Bonku”. The player transforms into the role of “The Enforcer”, the Anne we know from the title. This Master Bonku takes the role of a glorious and powerful king in some sort. The ruler of the land for the forgotlings, the world first seems like a place filled with graciousness. With hard work, forgotlings can get a ticket to be able to cross the “Ether Bridge”. The real world awaits them there and finally be able to return home to be reunited with their owner. The game starts with the heroine waking up to a gigantic explosion. As she examines the events through her window, she quickly comes to the conclusion that there was an attack. Master Bonku contacts her through the big mirror in her dwelling to confirm the incident. As his right hand, Anne quickly goes out to investigate on his behalf and tries to find out more about the motive of the rebels attack. After the fully animated cut-scene, the game gives you a brief, but adequate enough tutorial to get your adventure started. Destined to be the Enforcer, Anne always wears a glove with a device equipped on it. Called “Acra”, this tool allows you to extract and distribute energy from both forgotlings and power tanks. Taking away the energy from a forgotling will make him or her “crystalize”, which is basically the death sentence of an object. So Anne can both the executioner or choose to spare a forgotling at the same time. In a lot of ways, Forgotton Anne reminds me of Prince of Persia due to its’ platformer ways, coupled with movement and puzzle mechanics. She also isn’t able to face death in the game, thanks to some wings she will collect near the beginning of the first chapter. They will also help the Enforcer to perform larger and higher jumps, but she will never be able to just fly. It is necessary to explore the world to gain some energy into the device on your glove these puzzles because Anne is capable of transferring the gathered source of power into switches. They will make her, for instance, reach platforms or get rid of an obstacle so she can continue her journey. By pressing the Y button, you will enter the mode where you can send the energy away or collect it (to confirm your choice, you simply press A). It will be also possible to move a switch to let the energy flow through pipes and to the desired destination. Acra is also needed to the set of wings Anne is equipped with, so plan ahead. Thankfully, ThroughLine Games were generous with cruel-free sources where you can get that “fuel” that you can extract by holding A for the switches and wings from. Just as a little side note, you can intimidate a forgotling by leach a bit of their energy by holding A. Keep a close eye on the appearing symbol on the bottom right corner for that, so you will not accidentally kill him/her. For them to crystallize, you have to fill all four fragments of your glove. Your pair of wings can be activated by pressing down either L or R. If you pair them with movements, you can perform a longer and higher jump. Speaking of which, you can do hop by pressing B. Using the X opens a diary. That little book does not only document your whole story and progress, but it also works as a collection of mementos you can pick up along the way. The player won’t only face collectables while playing, our heroine has to make some decisions as well. Fulfilling the role as the Enforcer, you are given two possible answers to choose from that, with every progress you have made, somehow weight more heavily. They were not as impactful as you might know them from Life is Strange or The Walking Dead along other titles from Telltale, but they seldom felt negligible. You quickly start to learn that even more want to return to the human world than it might first seem like. An average playtime of 8 hours awaits you in Forgotton Anne, maybe up to 10 if you want to get everything in the game. The controls are simple and not too complicated. Although, it took me a short time to get used to them, especially in the platforming bits of the title. They were never too flimsy and after you got the hang of it, the game performs more than just well in every mode you choose to play it. The amount of platforming, story and puzzles had a healthy amount. The difficulty of the later never was too steep and frustrating. Maybe sometimes a little bit too easy, on the contrary. The scattered mementos in the world are not too hard to find if you keep a close eye and are open for exploring. Making an effort to get them all in your diary is for your admiration only, though. Looking at the photos of the trailer and the game itself only allowed one thought: “This looks like a Ghibli movie.” The graphics of Forgotton Anne, are simply beautiful and one of the best I have ever seen in that combination. It looks familiar thanks to the many movies we have been blessed from Ghibli studios but it also appears fresh in the gaming industry. Every setting is a delight of animation, be it Anne or any characters movement, the cut-scenes or anything else. Everything was considered with so much love that you want to admire every second of a playthrough. Sometimes I just stopped to watch Anne, flattening her dress after a jump or her straightening her hair. Responsible for the soundtrack you are submerged is the Copenhagen Philharmonic Orchestra. Forgotton Anne does not only look nice, but it also is a joy to listen to. It would be an understatement that the background music only serves as pleasant entertainment. No, it breathes life into the whole game as much as the cinematic animations do. Besides sharp and on point sound effects, the whole game is fully voice animated. An exceptional case is the Enforcer’s thoughts. The actors doing a decent job, even though it sometimes feels a bit flat. But to even have the option, is still highly impressive, even more, if you remember that this is an Indie title by a core team formed by 15 people. Even though you are provided with an automatic save function, I often miss this in a game. Especially if you have no possibility to skip a dialogue and/or a cut-scene. You won’t have fully fleshed out dialogues like Metal Gear Solid here, but it happened that I turned off the game and had to return to a scene I have seen before. Not the end of the world, though. The thing I would consider as the biggest con would maybe be the lack of touch controls. It would have been interesting and dynamic in my opinion to be able to pair touch with button controls. For example, letting Anne run towards the edge of a platform, tapping the location you want her to land and holding down the L/R button to activate her wings. It would have added a nice touch to the Switch port since you are clearly not able to do that elsewhere. When we are in the middle of being able to do or not do something else on another platform, collecting the relics you find in the universe of Forgotton Anne is rather pointless, with no achievement/trophy system, finding them makes no difference. Replay value is not very high, either. The story is beautifully written and a masterpiece of storytelling. Other than enjoying the journey of Anne a second time, this game provides no other reason besides decision variation for another ending to unlock to pick it up again. Again something a simple system of rewards would have fixed and encouraged you to play the second playthrough different as the first one. The motto of the developing team located in the beautiful capital of Denmark, Copenhagen, is “to amaze and surprise”. 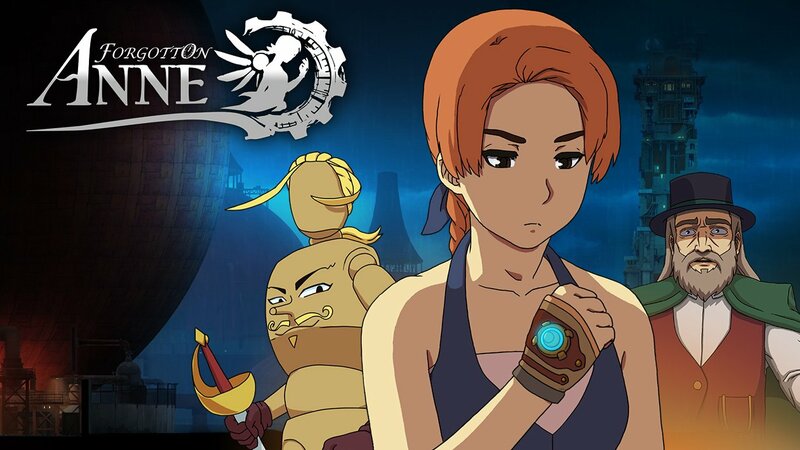 They clearly succeeded with their title Forgotton Anne and are more than just an inspiration for others with it. Everything is impressive and so outstandingly well done that I have absolutely no bad feeling recommending that title to anyone. The whole package of story, audio, visuals as well as mechanics makes Forgotton Anne a title you should not miss having in your Nintendo Switch library.